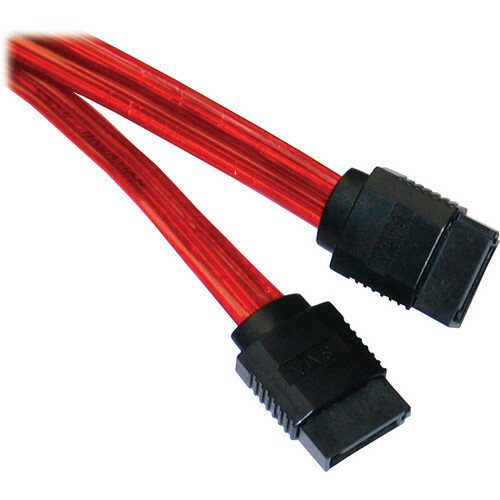 C2G 7-Pin 180 1-Device Serial ATA Cable - 36"
The 7-Pin 180 1-Device Serial ATA Cable - 36" from CablesToGo enables you to connect Serial ATA devices to your motherboard or host controller. Depending upon the peripherals used, you can get data transfer rates up to 6.0 Gbps! This cable is especially designed to handle the differential signals implemented in modern-day technology, while delivering increased throughput and minimized data packet loss. Receive higher data transmission rates, reduced crosstalk, and better signal integrity. What's more is this cable reduces overheating and conserves internal space within your CPU, for easy movement when adding or removing hard drives, PCI cards or other adapters. The SATA cable can reduce clutter, increase airflow and maximize your potential data transfer rate. Enables you to connect Serial ATA devices to your motherboard or host controller. Depending upon the peripherals used, you can get data transfer rates up to 6.0 Gbps! Especially designed to handle the differential signals implemented in modern-day technology, while delivering increased throughput and minimized data packet loss. Receive higher data transmission rates, reduced crosstalk, and better signal integrity. Reduces overheating and conserves internal space within your CPU, for easy movement when adding or removing hard drives, PCI cards or other adapters. Can reduce clutter, increase airflow and maximize your potential data transfer rate.